HP expand the X2 line with two new detachable computers: The Split and the SlateBook! HP have today announced two new new devices which continue along the same lines as the companies new HP Envy X2. They're tablets which you can dock into keyboards, much like we saw and continue to see with Asus' Transformer line of tablets! So lets get into the announcements! 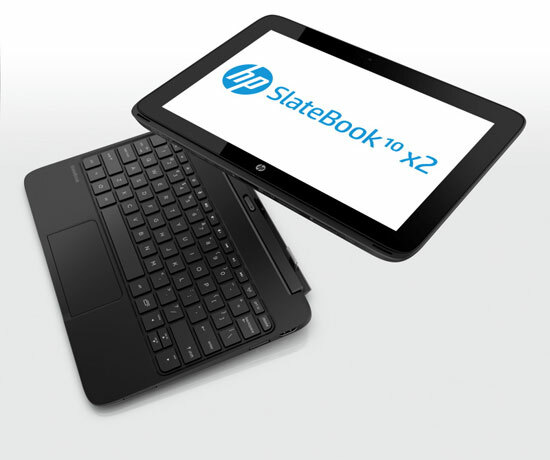 The first of HP's duo is the SlateBook X2. It's an Android tablet and it will be one of the first on the market which is rocking NVIDIA's Tegra 4 processor! That processor paired with 2GB of RAM should make Android 4.2.2 Jelly Bean absolutely fly! Other internals include memory capacities of up to 64GB and that cheeky little dock which you can see pictured to the right, has an extra battery in there to keep your device going that little bit longer while you're out and about! HP were keen to promote the access to TegraZone which the Nvidia processor brings with it and the extra games which are available as a result. But to be honest that pales into insignificance when you remember that there's a 10.1" screen which has a better than HD resolution on this thing! The screen is actually 1920 x 1200p and everything should look absolutely stunning on that sort of resolution on something so small! A couple of other things which HP mentioned were the DTS Sound+ Solution, native printing capabilities which will work from most apps and the main draw is obviously the dock which adds HDMI out, a couple of USB ports and near enough doubles the tablets battery life. The dock and tablet will arrive together in August for $479 for the 16GB variant and for the cheapest version it will cost $479, but the tablet dock is included in that price! The second device is another similar concept, but this time the device is powered by Windows 8 and it will be running on a 13.3" 1366 x 768p display. Where this device distinguishes itself from the Envy X2 is in the internal department. Yes there's a bigger screen, but there's also a lot more power under the hood. The Envy offered an Atom processor, but this thing comes with a Core i3 processor and 4GB of memory inside the tablet and there's anything up to 128GB of storage in the tablet half. The keyboard though helps to make this into a proper laptop because of the inclusion of a huge 500GB hard drive which is crammed into the bottom half! That of course is optional, but there will definitely be a battery in the keyboard, even if you decide you don't want to drop the extra money on the extra hard drive space. 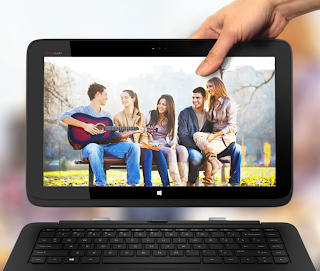 This tablet will also arrive in August and the starting price for both tablet and keyboard will be $799! If you're not sure which convertible is for you HP have a nice little comparison page, which is actually quite useful and the full press releases are available here!